I’ve written a lot of these Kingdom Hearts reviews. 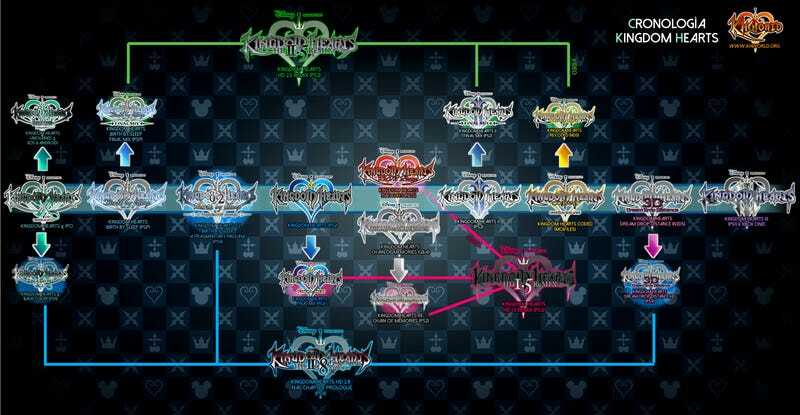 As the series has gotten bigger and bigger, I’ve always thought about how hard it must be for everyone to keep track of. With Kingdom Hearts 3 coming out soon (PLEASE) and “’Unchained Chi’ and ‘HD 2.8 Final Chapter Prologue’” out this year, I wanted to have a single page that aggregated the collective TAY knowledge on the subject. As I finish reviews for the rest of the games, or make other articles organizing the lore and gameplay nuances, I’ll update this article appropriately. Hopefully, everyone will be caught up to play Kingdom Hearts 3 when it finally comes out. Once I finish writing reviews for the other three available games (RE:Coded, Dream Drop Distance, and Unchained Chi) they’ll be posted here. I also have some gameplay tips for anyone who wants to play RE: Chain of Memories. It’s a pretty fun game if you figure out how to make it work for you. Geek Empress posted their ranking of which Kingdom Hearts games are the best. I don’t necessarily agree with their ordering, but there’s some good discussion and general overview in there if you want. So, yeah. I love these games. They’re a tremendous amount of fun. The story is always interesting, even if it dissolves into ridiculousness at times. And the characters always manage to look cool despite having way too many belts. And who doesn’t want to fight back against the darkness alongside Mickey Mouse and Aladdin?